News 24/7 presents an exclusive interview with the US Ambassador in Athens. 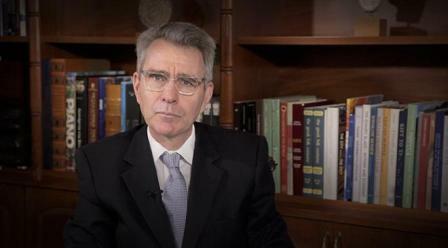 Geoffrey R. Pyatt spoke before the camera of News 24/7, with journalist Alexia Tasouli, about the issues between Greece and Turkey, the current matter of the two Greek soldiers, the negotiations regarding the name of Skopje, the result of the contacts made by Wess Mitchell, Assistant Secretary of State in Athens as well as the progress of the Greek economy in 2018. Remaining true to its philosophy of accurate and direct information on all current affairs, 24MEDIA’s news brand presents yet another significant journalistic piece of work, by speaking to the people in the center of events, such as the US Ambassador to Greece. Our readers can follow and read Geoffrey Pyatt’s interview on all News 24/7 digital platforms for PC, mobile phone or tablet.